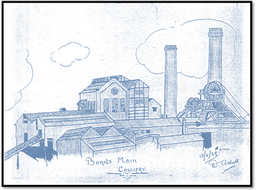 The original artist of the colliery drawing is William Ashall former miner at Bonds Main Colliery. The original drawing is with his Son-In-Law John Whysall. 13th June 1929. In 1882 the Staveley company leased 5,000 acre of coal reserves on the Sutton estates from William Arkwright under the terms of a sixty three year lease. 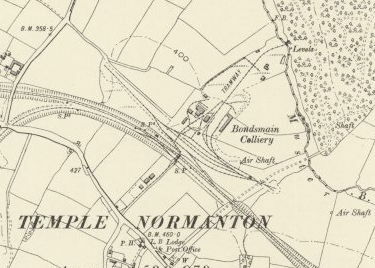 By the year 1885 the new Sutton colliery of Markham number one was in production, demand outstripped supply so a further colliery was sunk nearby at Markham as number two colliery. In 1895 the demand for coal once again outstripped the companies’ ability to supply it and so a further lease was taken out by the company for coal on the Sutton estate at Temple Normanton. This area had been worked by small collieries in the shallower seams and the new shafts were sunk 670 yards north, 29 degrees east of the church of Saint James. A branch line was constructed from Chesterfield to the colliery and to Calow Main colliery, the venture was started in 1899 and was completed on May 13th 1901, the tack bed was later utilised as part of the new Heath to Chesterfield M1 link dual carriageway. 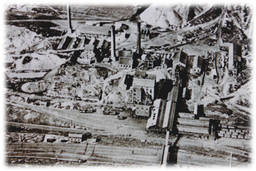 The colliery was sold to the Clay Cross company in 1924 as a going concern and was one of the collieries vested into the Coal Board on Nationalisation in 1947. The colliery closed in 1953 with the workforce being transferred to Arkwright colliery to work the newly opened First Waterloo seam. We are informed on the best authority that a new pit will be sunk on the Sutton Estate near Temple Normanton and that the operation will begin immediately. The coalfield is wholly the property of W. Arkwright Esq. and has been leased to the Staveley Coal and Iron Company Limited. Their present supply of house coal is approaching depletion. The new pit will be fitted with the latest machinery and will turn out 1,800 to 2,000 tons per day. A new pithead canteen for serving hot meals was opened by Brigadier General J. M. Jackson D.L. J.P. of the Clay Cross Company at Bonds Main Colliery on Wednesday. Dinner was served to fifty-six persons after whom Mr. Marsh (chairman of the canteen committee) introduced Brigadier General Jackson who said that he hoped the employees at Bonds Main would use the canteen to the greatest advantage. He also stated that the pithead baths would be added to the canteen when the opportune time came. Brigadier General Jackson is President of the Derbyshire Miners Welfare Committee. Other officials present were Captain G. R. Jackson (Clay Cross), Mr. G. F. Gardiner (Mining Agent) and Mr. C. W. Scott (Senior Mines Inspector), Mr. E. S. Spiller (Architect), Mr. R. J. G. Kearsley (Derbyshire Mines Canteen Organiser), Mr. H. S. Cockerill (Under manager), Mr. G. Froggatt (Canteen secretary), Messrs F. Nottingham, M. Hayes and L. Higginbottom represented the Derbyshire Miners Association Bonds Main Branch. Coal cutting operations were being carried out on the afternoon shift in the Three-quarter seam at Bonds Main Colliery on Friday when an outbreak of fire occurred at the coalface. A call to the North Midlands Mines Rescue Personnel at Chesterfield and Mansfield was promptly answered and an appeal for volunteers for miners of the village most of whom had only left the pit two hours previously from the day shift was responded to magnificently. The men along with the rescue parties and colliery officials carried fire fighting equipment to the scene of the outbreak which was brought under control in a very short time, there were no casualties. 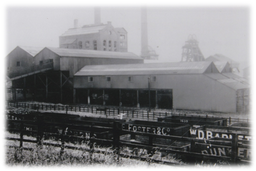 With the utmost co-operation on the part of all concerned Bonds Main Colliery was permanently close at the weekend and the majority of the workmen transferred by mutual arrangement to Arkwright Colliery. Arkwright had previously been worked on a single shift basis and is now working both days and afternoons on coal production. The change over has worked smoothly and the men are settling down at Arkwright with encouraging results so far. Even higher productivity is anticipated and the benefits to No. 1 Area and, therefore, to the mining industry as a whole, will be considerable. The output should eventually be doubled at Arkwright. Where productivity is outstandingly high compared with the low efficiency following difficult natural conditions at Bonds Main. Approximately 40 men were left behind at Bonds Main to carry out salvage work in the pit, an operation that will last at least a year. To carry out a major operation of this nature the full co-operation of management and workmen at both collieries was essential and in this case Area officials speak highly of the co-operation and goodwill of all concerned. The Area General Manager Mr. W. V. Sheppard was warm in his appreciation of the understanding shown and the help given by the National Union of Mineworkers Officials at Area and colliery levels. Mr. Sheppard regarded the successful closure as a “combined operation” in every sense of the phrase. After an illness of two years the death occurred on Saturday of Mr. William Marsh (77) 8 Nottingham Drive Wingerworth. Before his retirement Mr. Marsh was Manager for 25 years of Bonds Main Colliery and during that period was also Manager for two years of Clay Cross and Danesmoor Collieries. Mr. Marsh went to Canada to gain experience in mining and while there the First World War broke out. He caught the first boat to England to join up and served on the Western Front. Mr. and Mrs. Marsh have lived in Wingerworth for 16 years and prior to that at Temple Normanton.